Talent scouts for the Voice UK will be in Derry this week. The Voice representatives will be in the Millennium Forum between 11am and 3pm on Tuesday and say they’re keen to meet and listen to Derry singers who fancy their chances of making it through to the next series of the major UK talent competition. 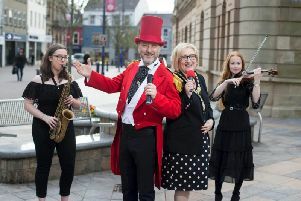 Warren Atkins, Assistant Producer for the Voice Series 5, who will oversee Tuesday’s meet and greet sessions in Derry said: “We are on the hunt for people with a genuinely fantastic voice to take part in our new series. We are looking for either soloists or duos who believe that they have what it takes to become the next big thing. Warren added that the Voice Team are keen to meet Derry’s finest talent and give local people an opportunity to have their voices heard.